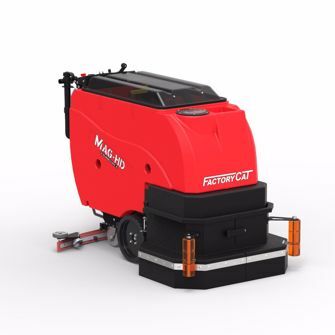 The Factory Cat Mag-HD is an extremely heavy duty walk behind floor scrubber that has been engineered to stand up to some of the toughest industrial cleaning applications. With very minimal training necessary, your operator will enjoy the ease of use and improved productivity this scrubber has to offer. The Mag-HD is the largest Factory Cat walk behind scrubber that is offered. For larger facilities there is an XL solution and recovery tank option adding an extra 5 gallons to each tank providing lengthened cleaning time. Just like most Factory Cat models, the Mag-HD can be configured as a disk or cylindrical machine. Disk models are available in either a 30 or 34 inch wide scrub deck configuration while cylindrical models come in 29 or 33 inches.